BARCELONA, Spain (AP) — Clashes between Catalan separatists and police in Barcelona left 14 people injured and led to six arrests Saturday as tensions boiled over days before the anniversary of the Spanish region’s illegal referendum on secession, which ended in violent raids by security forces. Separatists tossed and sprayed colored powder at police officers, filling the air with a thick rainbow cloud and covering anti-riot shields and police vans. Some protestors threw eggs and other objects and engaged with the police line, which used batons to keep them back. The clashes erupted after local Catalan police intervened to form a barrier when a separatist threw purple paint on a man who was part of another march of people in support of Spanish police demanding a pay raise. Officers used batons to keep the opposing groups apart. There were more confrontations as the separatists tried to enter Barcelona’s main city square where 3,000 people supporting Spanish police had ended their march. Barcelona Mayor Ada Colau pleaded for peace when the first scuffles broke out. The Catalan police told The Associated Press that the six arrests were made on charges of aggressions against police officers. The investigation was continuing. One police officer was hurt, although it was not immediately clear if the officer was among the 14 people reported by health authorities as needing medical treatment. Three were taken to hospital while the others were attended to on the street. There were ugly episodes between members of the opposing groups. An AP photographer saw a group of several people who had come to support the Spanish police being chased by a mob of around 100 separatists, some of whom tried to kick and trip the supporters before they could reach the safety of local police. Separately, a woman punched a man who supports Catalan secession in the face before police could separate them. The pro-police march had originally planned to end in another square home to the regional and municipal government seats but 6,000 separatists, according to local police, gathered in the square to force regional authorities to alter the march’s route. Some separatists arrived the night before and camped out in the square. The police march was organized by the police association JUSAPOL, which wants Spain’s two nationwide police forces, the national police and Civil Guard, to be paid as much as Catalonia’s regional police. JUSAPOL holds marches in cities across Spain, but Saturday’s march in Barcelona comes two days before Catalonia’s separatists plan to remember last year’s referendum on secession held by the regional government despite its prohibition by the nation’s top court. That Oct. 1 referendum was marred when national police and Civil Guard officers clashed with voters, injuring hundreds. JUSAPOL spokesman Antonio Vazquez told Catalan television TV3 that while the march’s goal was to demand better salaries, they also wanted to support the national police and Civil Guard officers who had been ordered to dismantle the referendum. “The national police and Civil Guard agents who acted last year were doing their duty and now they are under pressure and we have to support them,” Vazquez said. Last year’s police operation that failed to stop the referendum has become a rallying call for Catalonia’s separatists, who point to it as evidence of Spain’s mistreatment of the wealthy region that enjoys an ample degree of self-rule. “Outrageous! They shouldn’t be here. They came here to hit us a year ago and today they want to make an homage to that. It is pathetic,” said secession supporter Montse Romero. 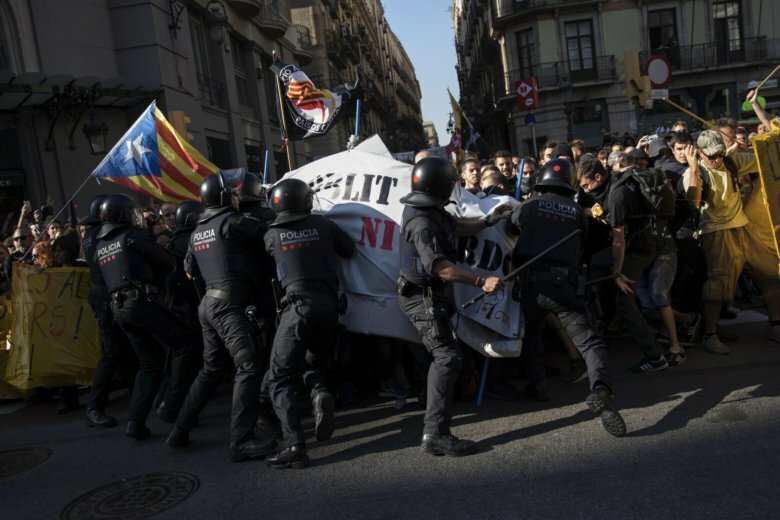 While Catalonia has seen huge political rallies take place without incident for several years, two weeks ago police had to intervene to keep apart rallies by Catalan separatists and Spanish unionists in Barcelona, the region’s capital. Catalonia’s separatist-led government is asking Spain’s central authorities to authorize a binding vote on secession. Last year’s illegal vote led to an ineffective declaration of independence by Catalonia’s parliament that gained no international recognition and triggered a months-long takeover by central authorities. AP video journalist Renata Brito and AP photographer Daniel Cole contributed to this report.